Roll d12 for the loot! Matched set of masterwork half-plate & masterwork heavy shield with silver shield spikes (1400gp). Weighs 70lbs. Armour is AC+8, armour penalty -6, spell failure 40%, weighs 50lbs. Shield is AC+2, armour penalty -1, spell failure 15%, weighs 20lbs. Shield spikes are a masterwork silver weapon doing 1d6 damage on shield bash. Mithril throwing hammer with ornate dwarven runes and ornamental blue gem inlays (1200gp). Weighs 1lb. Head is topped with a cabochon-cut blue jasper (100gp) and hilt inlaid with lapis lazuli bands (four bands worth 10gp each). The runes name the hammer 'Truesilver's Kiss'. Medium ornate-carved cedar chest (1100gp). Weighs 35lb. Contains six everburning torches, six vials of antitoxin and three thunderstones. Opens so torches light (harmlessly) around contents. Chest is worth 100gp (weighs 50lb empty). Crystal flask holding tawny liquid (1000gp). Weighs 1lb. Holds nine doses of exotic perfume (worth 100gp each) that grants +2 reaction bonus for anyone with a sense of smell. The flask is worth 50gp empty. Weighs 1lb. Ownership of an axebeak egg from a renowned breeder and trainer. Hatching, training, saddle, stabling and upkeep not included. Gold and ivory puzzle box (1000gp). Weighs 5lbs. Fiendishly difficult, requires a Disable Device (DC20, can retry once a day) then an Intelligence check (DC15) to open. Has hardness 7, 15 hit points and a break DC of 25. Large ornate-carved oak and ivory chest (1000gp). Weighs 280lbs. Contains 180lbs of silver dust in 18 burlap bags of 10lb weight (worth 5gp each). 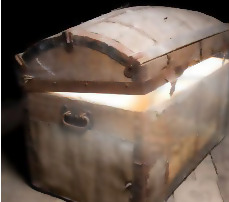 Chest is worth 90gp (weighs 100lb empty). Necklace of amber beads on gold wire (1000gp). Weighs 2lbs. Made up of 16 amber beads (50gp each) and a larger cabochon-cut amber (100gp). Ornate gold bracelet to fit large person (1000gp). Weighs 4lbs. Would suit efreet or fire giant. Silver fox coat with yeti fur trim (1000gp). Weighs 5lbs. Suitable for royalty, would suit an average human. Crystal-studded gold-plated conical open helm (900gp). Masterwork gold-plated breastplate with steel armour spikes (800gp). Weighs 30lb. +6AC, -3 Armour penalty, 25% spell failure. Would fit a muscular human. Spikes do 1d6 (x2) in grapple or as normal attack.